Christian funerary Mosaic of a ship owner called Felix. The mosaic depicts his two masted above a kantharos, a Greek styled drinking cup, with vines and foliage. At the top is a Constantinian monogram in a laurel wreath which symbolises the deceased devotion to Christianity. 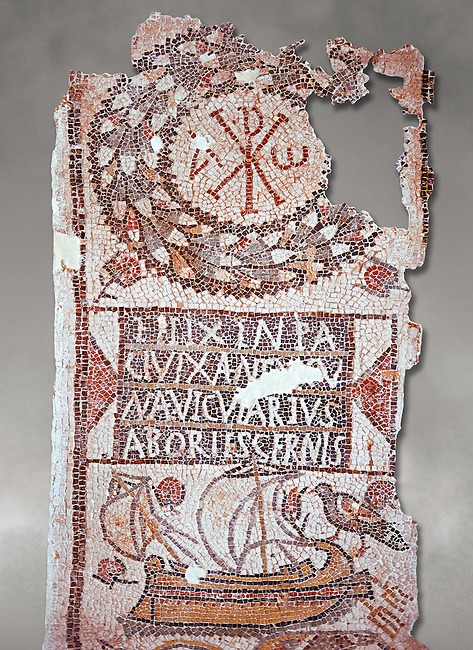 This early Christian mosaic is from Tabarka, 5th century AD. Roman mosaics from the north African Roman province of Africanus . Bardo Museum, Tunis, Tunisia.